Canara Bank PO Admit Card 2018-19 for Group Discussion / Interview is available to download from 24th January 2019 onwards for Probationary Officer post on the official website. The last date to download the admit card is 1oth February 2019. The shortlisted candidates from the computer-based test can download the Canara Bank PO Admit Card 2018-19 for GD/interview from the official website canarabank.com. 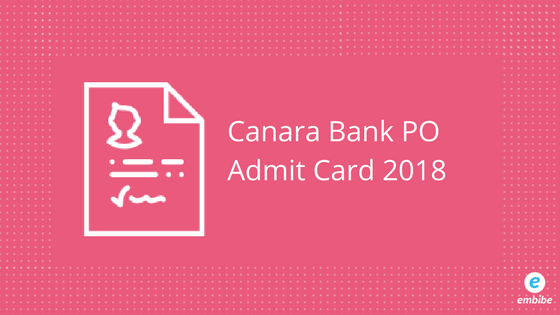 Aspirants should have registration number and password to download the Canara Bank PO Admit Card 2018-19. This year Canara Bank has released notification of 800 Probationary Officer Vacancies. The GD/Interview is scheduled from 4th February 2019. Aspirants need to download their Canara Bank Hall Ticket 2018 before the GD/Interview date. Candidates can check more details regarding the Canara Bank PO Admit Card / Hall Ticket in the article below. The candidates can download their Canara Bank Probationary Officer Admit Card from official website 2018 by following the steps given below. Enter your Registration Number/ Roll Number and Password / Date of Birth and click on “Login”. The admit card will appear on the screen. Download it and verify the details carefully. Take a print out of the Admit Card/Call Letter/Hall Ticket for future reference. Dearness Allowance, HRA, CCA, Medical Aid, Leave Fare Concession etc. and Perquisites like Conveyance, Quarters, Furniture etc., depending on the place of posting shall be paid as per rules. Exam Centre Name and Code. List of ID Proofs to be carried along with Canara Bank PO Admit Card 2018. There will be a negative marking of 0.25 marks for every incorrect answer. If for any question a candidate gives more than one answer, it will be treated as wrong and 0.25 marks will be deducted. If a question is left blank, i.e. no answer is given by the candidate, there will be no penalty for that question. We hope that this detailed article on Canara Bank PO Admit Card helps you. If you face any issues concerning the Canara Bank PO Admit Card 2018-19 or any aspect of the exam in general, drop your query in the comments section below. We will get back to you at the earliest. I am not able to find the link to download the Canara Bank PO Admit card. Also i want to query about the date and venue. kindly reply ASAP.